On Monday October 26, Senate Majority Leader Harry Reid called for the Senate health reform bill to include a public option. The bill will include a provision allowing states to opt out prior to 2014. The Senate bill will be sent to the Congressional Budget Office for scoring within the next couple of days. Reid skirted the question as to whether he had the 60 votes needed to bring a vote to the Senate floor. The much discussed trigger that would have delayed implementation of the public option will not be included nor scored. The bill will include the co-op provisions of the Senate Finance Committee bill. C-Span reports that progressive Democratic senators refused to accept anything less than the public option, driving the final decision by the majority leader. Why the Opt Out? According to Reid, "we have 60 people in the caucus. It's comfort level - - we all hug together and see where we come out." On Friday October 23, America's Health Insurance Plans (AHIP) met in the aftermath of a tumultuous month in which the health insurance companies' lobbying operation released a study it commissioned which according to the White House is "an attempt to confuse the debate around health reform." The consequences of this ill-timed report could include building momentum for an end to the anti-trust exemptions that the insurance industry has enjoyed since 1945. Guest author and Vice Chair of the HIT Standards Committee John Halamka reports on the October 14th meeting of the HIT Standards Committee, including important updates on patient access through portals, vocabulary standards, quality measures, security/privacy and the formation of a new implementation workgroup. The day started with comments from David Blumenthal. He briefly described the Nationwide Healthcare Information Network (NHIN) as an evolving vital element of our national health information strategy. He emphasized that we need to expand the scope of our NHIN thinking to include consumer health information platforms in addition to the provider and government organizations that have been the focus to date. He also noted that we need to move from pilots/prototypes to scalable real world implementations, establishing the right governance mechanism for the NHIN. The Clinical Operations update followed and included a discussion of gaps in the current work. We started with a discussion of patient access to an EHR. Should we include clinical summaries, the entire record, or the standard data elements that can be exported to commercial PHRs such as Google Health and Microsoft Healthvault? We heard about experiences at Kaiser, Geisinger, BIDMC and others. It's clear that PHR data sharing is very heterogeneous at the moment and that convenience transactions such as appointment making, medication renewal, and referral management may be more important to patients than full access to every aspect of their record. The HIT Policy committee will be asked to define minimum requirements for patient access to EHR data. We discussed needed enhancements to vocabularies including a national SNOMED-CT to ICD9/ICD10 mapping, RxNorm mapping to National Drug File Reference Terminology (NDF-RT) and Standard Product Labeling (SPL), a standard lab compendium for ordering, UCUM guidance and testing, and a national infrastructure to distribute and maintain codesets. I discussed this need for enhanced vocabulary tools in yesterday's blog. Our action item today was to create a Vocabulary sub-Workgroup that will address these issues and propose priorities and solutions to the entire Committee and ONC. We heard an update from the Clinical Quality Workgroup about the re-tooling of quality measures to be more EHR-centric. Good progress is being made. Next, we focused on privacy & security. Dixie Baker and Steve Findlay summarized a few updates to the standards matrix - SOAP 1.2 is the current recommended version and per evolving federal guidelines (NIST SP 800-63-1), Kerberos will be allowed but not required for 2011 because Federal systems will begin disallowing Kerberos in 2013. NIST SP 800-63-1 is cited as implementation guidance for "Level 2" certification criteria for authentication, but we've been careful not to impose Federal FISMA criteria on the private sector. * Specification of Health Information Exchange assumptions and associated privacy and security policy. This relates to my blog yesterday in which I noted that policy guidance is really essential to pick the simplest set of security constructs needed to protect confidentiality. 1. To spend the entire November HIT Standards Committee meeting hearing testimony from stakeholders on Security issues. 3. To specify our assumptions for HIE information exchanges and share those assumptions with the Policy Committee so that they could specify a policy framework that then could serve as the basis for constraining security and privacy standards. One of our committee members noted that policy constrains architectural possibilities, enabling selection of the simplest set of standards needed to meet requirements. Given the emphasis of the meeting on adoption and implementation, we discussed next steps regarding our new Implementation Workgroup. Specifically we will arrange for a day of testimony on October 29 from many stakeholder groups to better understand adoption and implementation issues, needs for enhanced implementation guidance, and identification of enablers that would accelerate interoperability such as new tools or filing standards gaps. We'll also conduct an online forum and accept written testimony. This feedback process is very important to ensure rapid cycle improvement in the standards making and standards selection processes. Per my blog yesterday, this will help with resolving the outstanding common data transport issues. We ended the meeting with a discussion of the results from the privacy hearings conducted by the HIT Policy Committee on September 18. Thus, we have action steps to resolve all the issues I raised on my blog yesterday - alignment of policy and standards activities to create the parsimonious set of security standards to protect confidentiality, a working group to resolve outstanding vocabulary issues, and a feedback process to resolve common data transport and other standards adoption/implementation issues. A great meeting and I look forward to our day of implementation testimony on October 29 and our day of security testimony on November 19. Dr. David Blumenthal, National Coordinator for Health IT (ONC) has published an open letter on the Meaningful Use of Electronic Health Records. Blumenthal reported that CMS will issue it's proposed rule by year end. I recently reported on our announcement of State Health Information Technology Grants and grants to establish Health Information Technology Regional Extension Centers, as authorized under the Health Information Technology for Economic and Clinical Health (HITECH) Act provisions of the American Recovery and Reinvestment Act of 2009 (the Recovery Act). Today I want to discuss the important term “meaningful use” of electronic health records (EHRs) – both as a concept that underlies the movement toward an electronic health care environment and as a practical set of standards that will be issued as a proposed regulation by the end of 2009. The HITECH Act provisions of the Recovery Act create a truly historic opportunity to transform our health system through unprecedented investments in the development of a nationwide electronic health information system. This system will ultimately help facilitate, inform, measure, and sustain improvements in the quality, efficiency, and safety of health care available to every American. Simply put, health professionals will be able to give better care, and their patients’ experience of care will improve, leading to better health outcomes overall. As many of you are aware, the HITECH Act provides incentive payments to doctors and hospitals that adopt and meaningfully use health information technology. Eligible physicians, including those in solo or small practices, can receive up to $44,000 over five years under Medicare or $63,750 over six years under Medicaid for being meaningful users of certified electronic health records. Hospitals that become meaningful EHR users could receive up to four years of financial incentive payments under Medicare beginning in 2011, and up to six years of incentive payments under Medicaid beginning in October 2010. The HITECH Act’s financial incentives demonstrate Congress’ and the Administration’s commitment to help those who want to improve their care delivery, and will serve as a catalyst to accelerate and smooth the path to HIT adoption by more individual providers and organizations. The dollars are tangible evidence of a national determination to bring health care into the 21st century. ONC has already engaged in a broad range of efforts to support the development of a formal definition of meaningful use. The HITECH Act designated a federal advisory committee, the HIT Policy Committee, with broad representation from major health care constituencies, to provide recommendations to ONC on meaningful use. The HIT Policy Committee has provided two sets of recommendations, informed by input from a variety of stakeholders. ONC and CMS have also conducted a series of listening sessions to solicit feedback from more than 200 representatives of various constituent groups and an open comment period where over 800 public comments were submitted and reviewed. The second set of recommendations on meaningful use was issued at a July 16 HIT Policy Committee meeting and details can be found at healthit.hhs.gov/policycommittee. CMS is expected to publish a formal definition of meaningful use, for the purposes of receiving the Medicare and Medicaid incentive payments, by December 31, 2009. At that time, the public will be able to comment on the definition, and such comments will be considered in reaching any final definition of the term. By focusing on “meaningful use,” we recognize that better health care does not come solely from the adoption of technology itself, but through the exchange and use of health information to best inform clinical decisions at the point of care. Meaningful use of EHRs, we anticipate, will also enable providers to reduce the amount of time spent on duplicative paperwork and gain more time to spend with their patients throughout the day. It will lead us toward improvements and sustainability of our health care system that can only be attained with the help of a reliable and secure nationwide electronic health information system. The concept of meaningful use is simple and inspiring, but we recognize that it becomes significantly more complex at a policy and regulatory level. As a result, we expect that any formal definition of “meaningful use” must include specific activities health care providers need to undertake to qualify for incentives from the federal government. Ultimately, we believe “meaningful use” should embody the goals of a transformed health system. Meaningful use, in the long-term, is when EHRs are used by health care providers to improve patient care, safety, and quality. As stated above, the next step in our process is a notice of proposed rulemaking in late 2009 with a public comment period in early 2010. As this process unfolds, we will continue to talk and share experiences about transitioning to EHRs, and to help deepen understanding among physicians and hospitals about the use of EHRs. We will also present programs designed to help smooth the transition process, and identify activities physicians and hospitals can engage in now to promote adoption of EHRs. As efforts advance, we will turn our attention to other necessary supporting programs, some of which you will hear more about in the coming weeks, including defining what constitutes a “certified” EHR, which is one of the requirements to qualify for Medicare and Medicaid incentives. Armed with an understanding of the discussion of meaningful use as it unfolds, providers can begin to consider how their own practices or organizations might be reshaped to enhance the efficiency and quality of care through the use of an electronic health record system. Be assured you will not be alone as you seek to adopt an EHR system. Through our recently announced collaborative HITECH grants programs and others to be initiated later this year, we will continue to support providers in moving forward. Additional details about the grants are also available in my previous update and at healthit.hhs.gov/HITECHgrants. To some providers, particularly small or already stretched physician practices or small, rural hospitals, the path toward meaningful use may still seem arduous. To others, who would just prefer to stick with the “status quo,” it may seem like an unwanted intrusion. We believe that the time has come for coordinated action. The price of inaction – in adverse events, lost patient lives, delayed or improper treatments, unnecessary procedures, excessive costs, and so on – is just too high, and will only get worse. There is much at stake and much to do. We must relieve the crushing burden of health care costs in this country by improving efficiency, and assuring the highest level of patient care and safety regardless of geography or demographics. By using current technologies in a meaningful way, as well as technology to be developed in the future, we will take great strides toward solving some of the most vexing problems facing our health care system and creating a new platform for innovative solutions to health care. I look forward to providing periodic updates, and to continued interactions with all the communities that have so much to gain from this profound transformation. A demonstration project by Group Health found that the Patient-Centered Medical Home (PCMH) "redesign can be associated with improvements in patient experience, clinician burnout, and quality without increasing overall cost." With PCMH, Group Health found that the patients' experience was rated higher on 6 out of 7 indicators without an increase in costs. "For staff burnout, 10% of PCMH staff reported high emotional exhaustion at 12 months compared with 30% of controls, despite similar rates at baseline. PCMH patients also had gains in composite quality between 1.2% and 1.6% greater than those of other patients. PCMH patients used more e-mail, phone, and specialist visits, but fewer emergency services. At 12 months, there were no significant differences in overall costs." 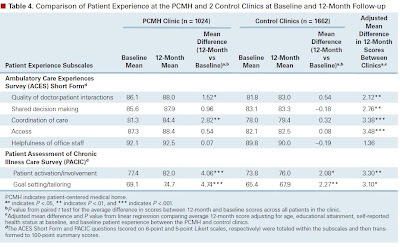 Prior to the PCMH demonstration project, Group Health had implemented access and efficiency improvements which increased patient satisfaction but also increase physician fatigue. 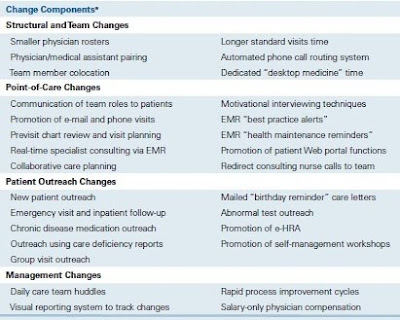 The improvements had included "same-day appointment scheduling, direct access to some specialists, primary care redesign to enhance care efficiency, variable physician compensation (salaries with relative value unit [RVU] incentives), and an electronic medical record with a patient Web portal to enable patient e-mail, online medication refills, and record review. The reforms succeeded in improving patient access and satisfaction, but also increased physician workload, as evidenced by larger panel sizes, greater resource intensity per face-to-face visit, and increasing adoption of patient e-mail. These workload changes, combined with the implementation of the electronic medical record, resulted in fatigue and decreased work satisfaction. Relative reductions also were seen in nationally reported quality-of-care indicators as well as downstream utilization increases in specialty care, emergency care, and inpatient days." The implementation of the Patient-Centered Medical Home was organized around the relationship between the primary care physician and the patient. The primary care physician leads the clinical team and coordinates the planning of care with the patient. "Maximum use of technology" facilitates patient access. Group Health implemented changes related to the structure of the care teams, point-of-care, patient outreach and management. Changes included "the use of team huddles, previsit outreach and chart review, and use of patient-centered quality deficiency reports. The PCMH clinic emphasized both e-mail and telephone encounters (as an alternative or complement to in-person visits), depending on patient abilities and preferences." As a result of its success, Group Health is expanding its Patient-Centered Medical Home program to all of its centers.